Negre, M., Keijzer, N., Lein, B., Tissi, N. 2013. Towards renewal or oblivion? 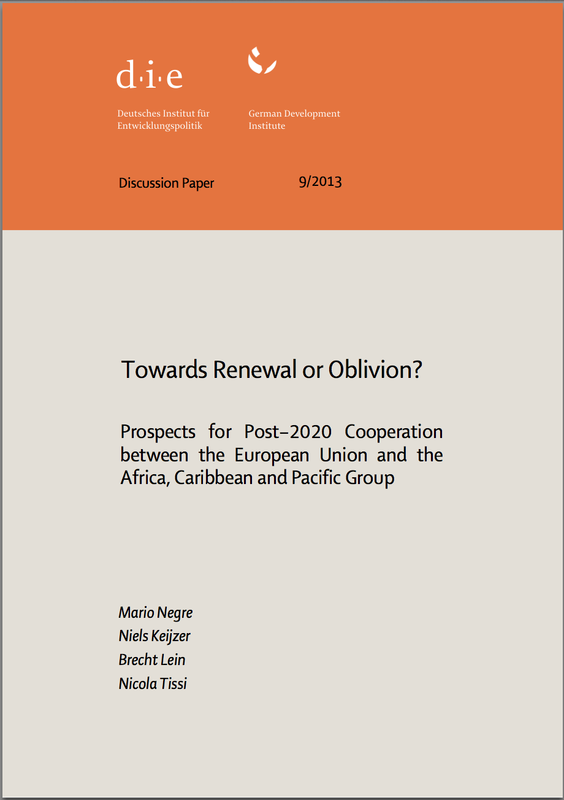 Prospects for post-2020 cooperation between the European Union and the Africa, Caribbean and Pacific Group. (DIE/GDI Discussion Paper 9/2013). Bonn: German Development Institute. The Cotonou Partnership Agreement, the current framework for the EU’s political, trade and development cooperation with the African, Caribbean, Pacific (ACP) Group, is set to expire in 2020. A fundamental rethinking of the Agreement is now underway. Most studies on future modalities for ACP-EU cooperation post-2020, have focused on the institutional running of the Agreement. This new joint research project by ECDPM and the German Development Institute seeks to complement these studies with perceptions on the past, present and future of the EU and ACP’s special relationship gathered from a selection of 10 ACP countries. The findings display a clear gap between Brussels and the ACP constituencies in terms of understanding, interest and appreciation of ACP-EU cooperation. One of Europe’s most remarkable external achievements is a comprehensive and legally binding international cooperation agreement that unites more than half of the world’s nation states. Signed in Benin in 2000, the Cotonou Partnership Agreement (CPA, commonly referred to as the ‘Coto- nou Agreement’ or just ‘Cotonou’) intends to intensify the long-standing cooperation in politics, trade and development between the European Union (EU) and the countries of Africa, the Carib- bean and the Pacific (ACP). This collaboration has led to the creation and evolution of unique institutions that facilitate ACP–EU cooperation among public officials, members of Parliament, and many other partnership actors.